I've been doing some searching over the internet and can't quite find the answer I'm looking for. I recently purchased a set of Tein Street Advance coilovers from Moss Miata, and they are supposed to have 16 degrees of dampening adjustment. When I adjust mine, from full soft to full hard there are 32 clicks. Does anyone know if they updated the Street Advances to have more degrees of adjustment? Or is it 2 clicks per setting giving it 16 degrees of adjustment? Thanks! 4 Miatas and counting. 1993 Miata, 1994 M Edition Miata, 2001 Miata. 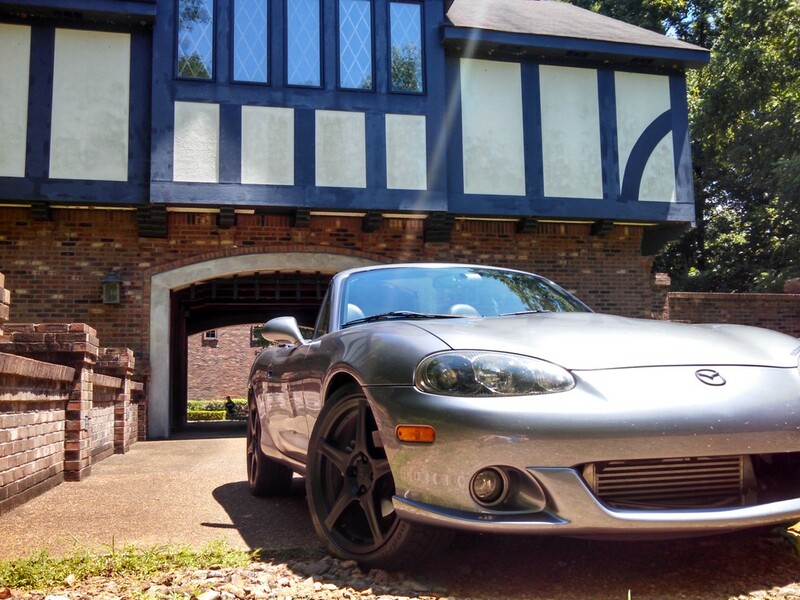 Current car, 2004 VR MSM. Current mods, Boss Frog roll bar, AEM UEGO, FM O2 signal modifier, GReddy Profec B Spec II boost controller, Track Dog Racing full aluminum radiator, authentic HKS SSQV IV BOV, FM 2.5" downpipe, custom 2.5" straight pipe from cat back, Tein Street Advance coilovers, Konig Wideopen 15x8's on Advan AD08R tires. If I remember correctly, to adjust the damping you are always supposed to start at full stiff and go back 0-16 clicks. I think it said don't go past 16 or you risk damaging the shock. Not sure how it damages it, but I wouldn't do it. You will probably find you like the shocks set around 8 clicks+/- a few anyway. I'm also not sure why they would design it to have 32 clicks if it is bad to go past 16, but I assume it has something to do with how it is manufactured. You would think they would have the hard stop at 16. With cheaper coilovers there's not really a huge difference between 1-2 clicks. 90% of the 16 way adjustable budget coilovers under the $1200 range in my opinion are really more just, full soft, medium, and stiff. With about every 5-6 clicks making a noticeable difference. Not sure how you'd be getting 32 clicks though. Maybe double check with tein support, maybe you got a bad batch? Do all of the coils have 32 clicks? Mine also have more than 16 clicks but I did not count how many. I have yet to install mine and they are packed away for now. I am getting them for Christmas but opened the box when it arrived to make sure everything was alright. Some of the worst packaging I've ever seen from a reputable company, but they were undamaged. I have 32 clicks on all of them. I'll have to call Tein and ask and see. I agree, lots of brown cardboard. I honestly expected a nicer box with some formed foam inside, or at least some packing peanuts. ^ This. Higher-end coilovers don't have eleventy billion points of adjustment, because the ones they do have actually make a noticeable difference. Bilstein PSS9's have 9 points, while Megan EZ Streets or whtever have 32. Anyhow, as others have said, you should not adjust past the 16 "clicks" on that particular shock, even though the shock allows you to. Let us know how you like the Tein SA, as they sure have come down in cost.